Accessories: Accompanied by Patek Philippe Certificate of Origin dated June 18, 2008, original sales tag, setting pin, product literature, wallet, fitted presentation box and outer packaging. Presented in 2006, reference 5980/1 was launched alongside its time-only sibling reference 5711. A particularly early example displaying a blue dial, this watch is preserved in impressive and near-mint condition. It is replete with its original accessories such as the Certificate of Origin, sales tag, setting pin, leather wallet, product literature and presentation box. 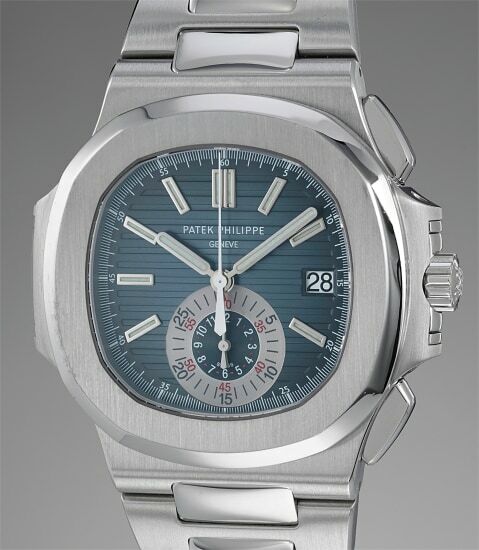 Furthermore, it has been serviced by Patek Philippe and retains its service sticker and service box.